Today, I am SUPER excited to announce a partnership giveaway between me and two lovely bloggers from Eat it and Say Yum and Nicole from The Jones Way. Karissa is my sister-in-law and contacted me a couple of weeks ago about the giveaway, asking if I would like to contribute. Of course, I agreed, but not until two days before the giveaway actually started (life has been busy the past couple of weeks, remember?) So on Saturday, I went to the store, bought all the materials I'd need and spent that night making a kind of urban, hip, cutesy apron that ended up looking more like a dress than an actual apron (was that my goal? yes it was). I am so pleased with how it turned out! So, there's a theme to this giveaway. With Thanksgiving just around the corner (take a few deep breaths...), it would be nice to have few things to help you prepare, right? That's what this giveaway is all about! 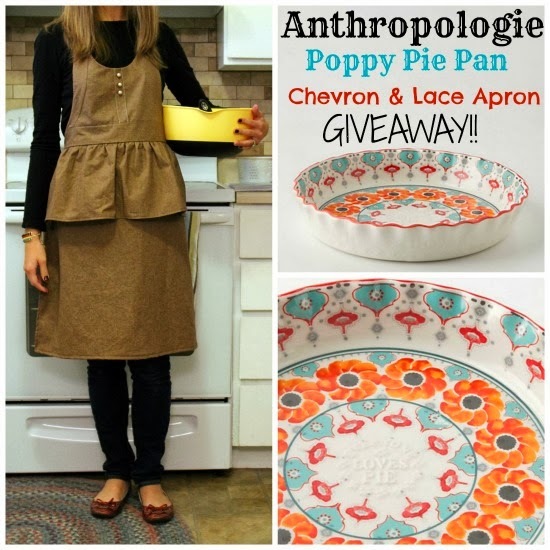 Karissa and Leia will be sending one lucky winner my apron, one totally adorable Poppy Pie Pan from Anthropologie, and some extra goodies to keep you going throughout the Holiday preparation period.